Heartland Hope Mission always accepts clothing and household items to distribute to families in need. We do NOT accept furniture however, we will begin a list of needed furniture items to connect with our clients in the future. Please also consider making a monetary donation to help serve families in need. As always, all donations stay local. 100% of funds will be used to serve families in need in our community. $31 helps 1 person displaced by the flood for one month. $62 helps 2 people displaced by the flood for one month. $93 helps 3 people displaced by the flood for one month. $124 helps a family of 4 displaced by the flood for one month. Please use this box if you would like to give a custom amount. You can drop off your donation at one of our locations during the hours listed below. 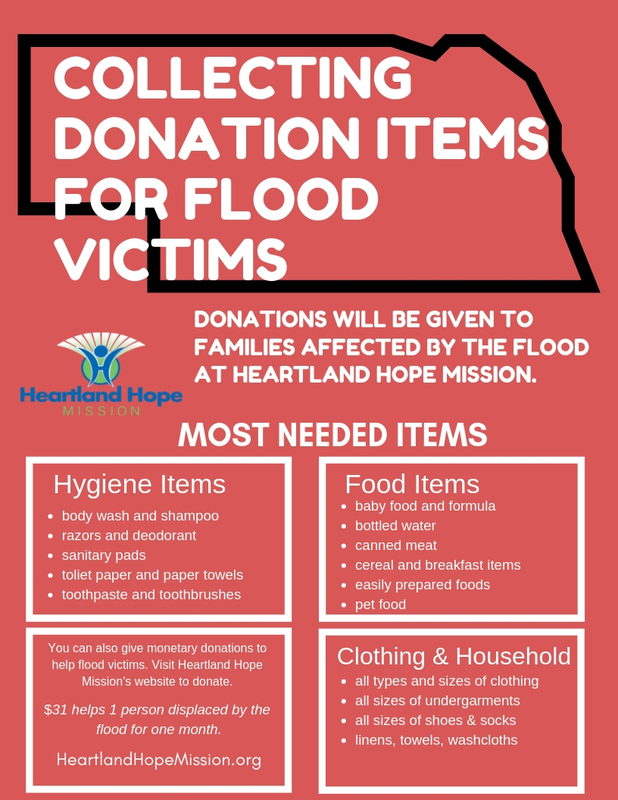 You can also schedule a drop off by contacting Renae by phone at 402.733.1904 x11 or by email Renae@HeartlandHopeMission.org. Tuesdays: 6:30 pm to 7:30 pm. Thursdays: 1:30 pm to 4:00 pm. Saturdays: 9:30 am to 12:00 pm. 2nd Saturday of the month: 10:30 am to 11:30 pm. Last Wednesday of the month: 1:30 pm to 3:30 pm. You can download and use this flyer to collect donation items for flood victims. Here is a suggested list of items needed for flood victims. You can donate these items during our donation drop off hours listed on this page.